Download FTS WORLD CUP RUSSIA 2018 by ZenM - It is a new mod from Vietnam. First Touch Soccer is the most recent Android Football Game. FTS WORLD CUP RUSSIA Mod 2018 by ZenM, which Comes Along With Apk +Obb Data. With so many new features that have been updated. For passowrd, please ask directly with ZenM Facebook account, I have listed below. Because here I only Share. 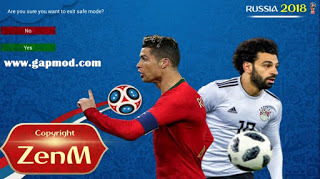 For those who want to try to play FTS WORLD CUP RUSSIA 2018 Apk Data Obb source from ZenM, you can download now at Basetechs.blogspot.com. For how to install is still the same as the previous FTS mod in android device. Extract the file first when it is finished in download. Immediately play !! •+ Most of the national teams in the continent. Most of the players will be convened in the 2018 World Cup in June. •- The mod was born with the criteria to bring new experiences for players, instead of the cup as boring as before. Then the two modes Manager Mode and Quick Match will be more attractive to the national team. The mod will be your companion during the upcoming World Cup. •- The mod has many inevitable shortcomings, and of course to have a new and more experimental mode of play so the mod will not be complete, so you do not ask yourself. It is said that the "Tournament Mode> Fifa World Cup" will not be as realistic as the national team, so it is definitely an unavoidable point and you have to accept it. •- For the players skin, so that a player in the national team and the same skin is impossible, so in some cases the national team you like will not have the skin as desired. However, on the page and the forum has a lot of skin is already available, anyone like him, then just copy the obb, it is not too simple. However, there are still a number of famous clubs that are retaining the mod. •- The story to extract the file and copy it will not be mentioned on the pin already. For Android: v4.0 – v4.0.4 [Ice Cream Sandwich] , v4.1 – v4.3.1 [Jelly Bean], v4.4 – v4.4.4 [KitKat] , v5.0 – v5.0.2 [Lollipop], v6.0 [Marshmallow], and UP.